Cries of "It's a lot of money" "You can do a lot with that"..
Jed reminds everyone he has Box 7, his lucky number which he has selected. Jed asks for the £21,000 question and says..
Jed has DEALT for £21,000 and will take that away for Christmas. Noel now opens Box 7 to see what Jed had in his lucky box..
Jed missed out on £79,000.. The 10p was revealed by the last "winger". The Banker says he admires Jed's baubles and respects him. The Banker's last message was that was the game he wanted for Christmas. Deal on tour delivers, says Noel. The final EVER Deal or No Deal airs tomorrow, 4pm. I'd watch it, could be an explosive end to a sensational 11 years. Last edited by Archstered on Thu Dec 22, 2016 6:01 pm, edited 1 time in total. Last edited by richie4eva1 on Thu Dec 22, 2016 6:02 pm, edited 1 time in total. this would've been the biggest weekly payout in Deal history. From two box the game reminded me very much of Orry actually! Some terrible offers coming over that phone today, a rather piss easy £21k for people if not the hundred grand! Yout have to give the Banker credit though: he's really playing the players during these specials, rather than just offering around the Fair Deal from the 2nd offer onwards like he did in most of the last 400 studio shows. He could have a Deal at 3 box today easily enough! If the £250,000 was still in play. That's true actually, Jed was rather emotional (understatement ) compared to other people this tour! Fair enough result from perfectly reasonable play. Hopefully he won't have too many regrets. Hopefully he won't have too many regrets. 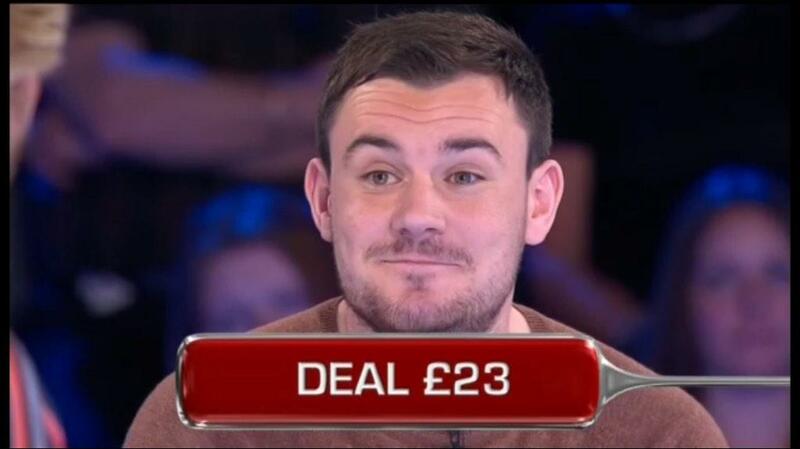 He'd have had an even more massive regret if he'd turned down the final offer and won 10p! Was half-expecting a 3-box offer there; it's not just with the £250k in play that happens. We've seen £4k dealt on a 5-box like that before (and maybe 3 years ago when we were last bereft of box 23, £3,777 might've been a deal) so credit to Jed for at least not standing for that. It was a great show at Longleat Safari Park. One show left. A late Happy Birthday to Noel.